As you all may have realized by now, the 70s is my thing and if I could have chosen any time period to live in, without a doubt it would be this era. The music, style, and women taking a stand for their rights, especially as journalists, are just a few aspects that stand out. With Dumbo hitting the big screen again in a live action update, I decided to combine my fascination with this era and with a circus style. 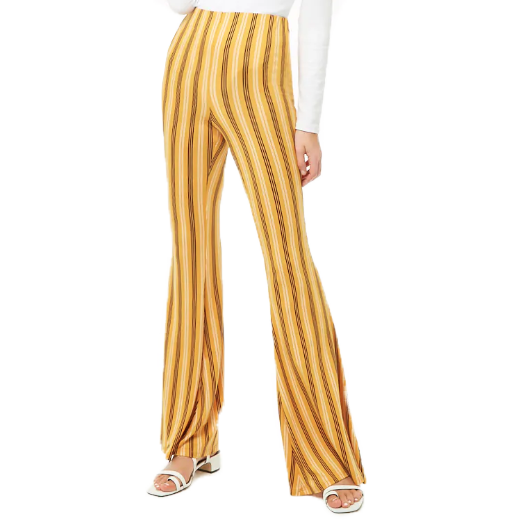 Flare style pants were definitely one of the more iconic pieces to come out of the 70s. I knew I needed a pair to go with my Dumbo tees as they have the perfect circus look to them. In a way, they remind me of a whimsical circus tent! 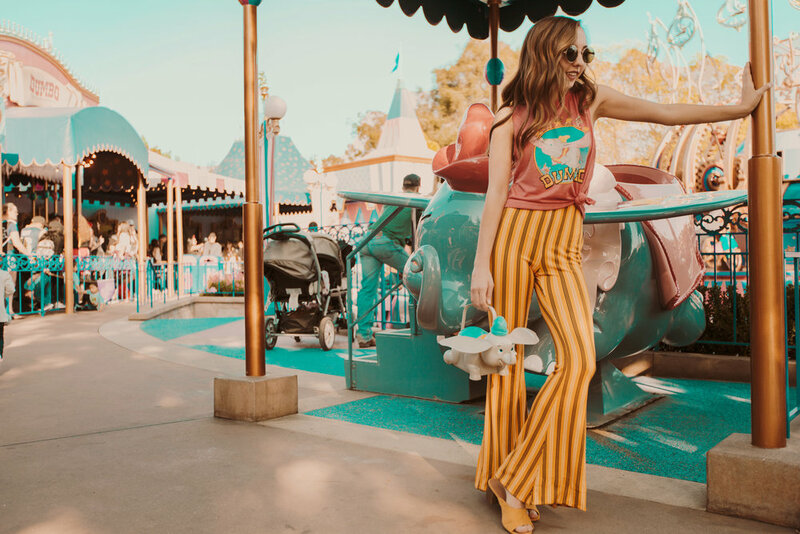 I picked up this adorable pair from Forever 21 for just $14; they are just oh so comfy and the perfect pants for a day in the parks. Now that the days are gradually becoming warmer, the perfect tank is a must need, especially if it features one of my favorite rides: Casey Jr. I have been a fan of tying up my tees lately and it works wonders with high rise pants like the ones I am sporting. It’s the perfect look to add a bit of flare as well as a quick fix for shirts that are too long or wide. 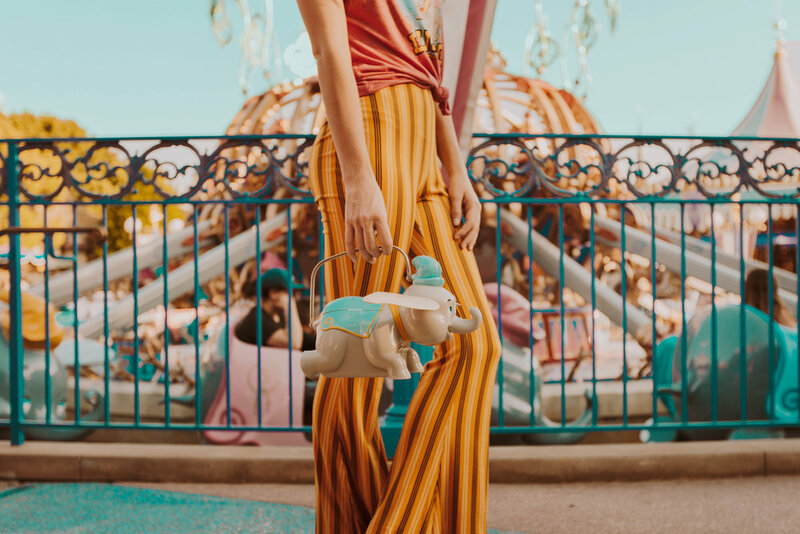 A few months ago, my mom found this adorable Dumbo popcorn bucket at an estate sale for just a few bucks and I have been holding on to it just for this shoot. You have no idea how hard it was to look at this everyday and not use it for photos! If you’re in the market for vintage Disney and don’t mind the hunt, both estate and yard sales are an awesome option for those who don’t want to spend a fortune! 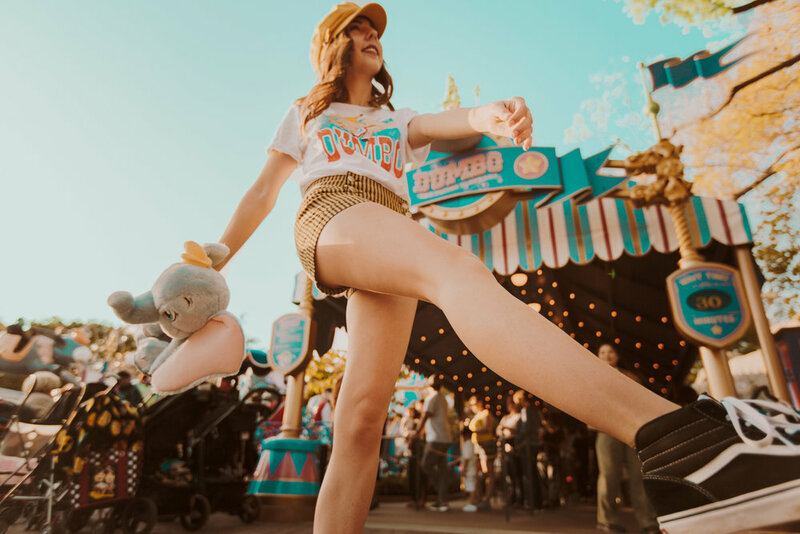 A comfy tee and pair of shorts are the ideal combo for a long, hot day at the parks. Not only is this look the comfiest you’ll get, but it’s so easy to spice up a bit. 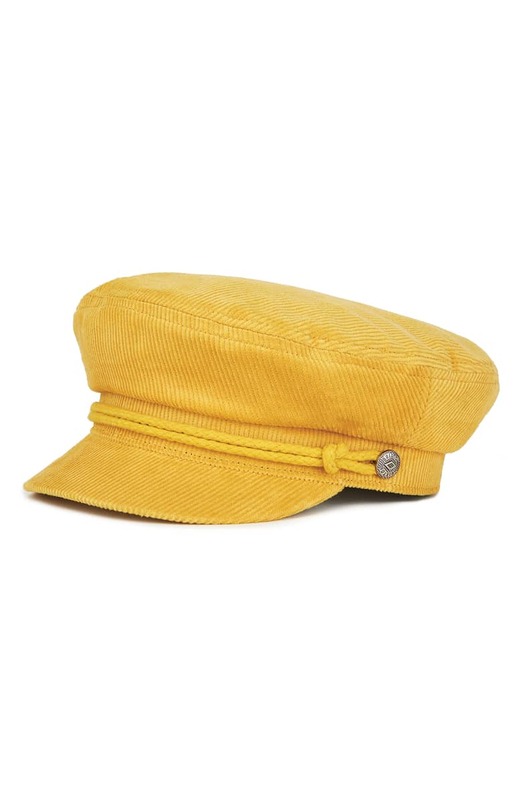 I added my favorite Brixton cabby hat to complete the look and take it from casual to a bit more stylish. 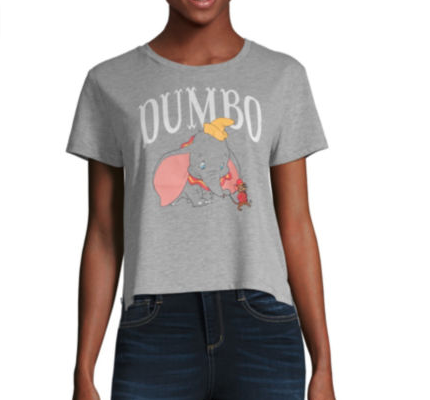 My boyfriend, Quin, was in a Ross looking for pants and just happened to come across this adorable Dumbo tee randomly hanging in the men’s section. He immediately sent a photo over and I of course had him pick it up. Seriously, get yourself a boyfriend who supports your Disney addiction! If you’ve never stepped foot into a Ross, then you need to run, not walk! Believe it or not, this place is stocked full of Disney clothes. My brother even scored tons of pieces from the Mickey x Neff collection a few months ago for under $20 each. Anyone else a backpack lover? They’re pretty much a must have for me on every Disney trip. The smaller purses just don’t cut it! Maybe I just have too much stuff though? Lulabites reached out and was kind enough to gift this Loungefly backpack, just as I was prepping for this shoot. 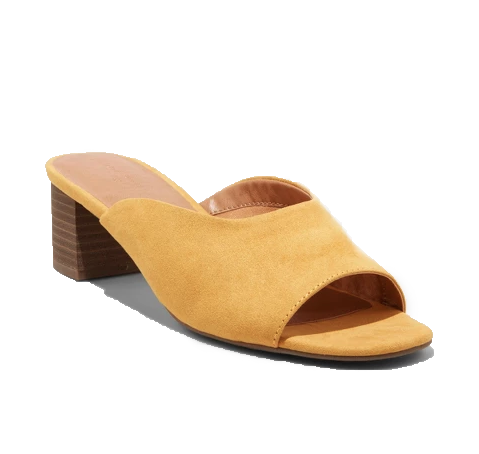 Right now it’s sold out on the site, but I’ve been told they’ll be restocking soon! If you’re looking for those hard to find Loungefly pieces, this site is one you’ll need to check out. High rise pants are another go to park style for me! I found this funky pair at a random thrift shop in Oceanside a few months ago for just $2. I knew I would use these for this shoot, so just like the popcorn I had to put these shorts away and pretend they didn’t exist for weeks. It was hard! And that’s it, two looks perfect for a day at the parks or a trip to the theater to see the film! Are you planning on seeing the movie? If so, come back here and let me know what you thought of it in the comments! A big shoutout to my sweet friend Madasen for coming the the rescue last minute and helping make this shoot come to life. Didn’t she kill it?! ?